They say there’s a spirit for every occasion, and you can find them all in Chicago—after all, with a cocktail bar scene providing us with endless Bloody Marys and old-fashioneds there’s plenty of drinks to enjoy in the city. There are whiskeys to warm your winter nights, gins to while away a summer afternoon and everything in between. 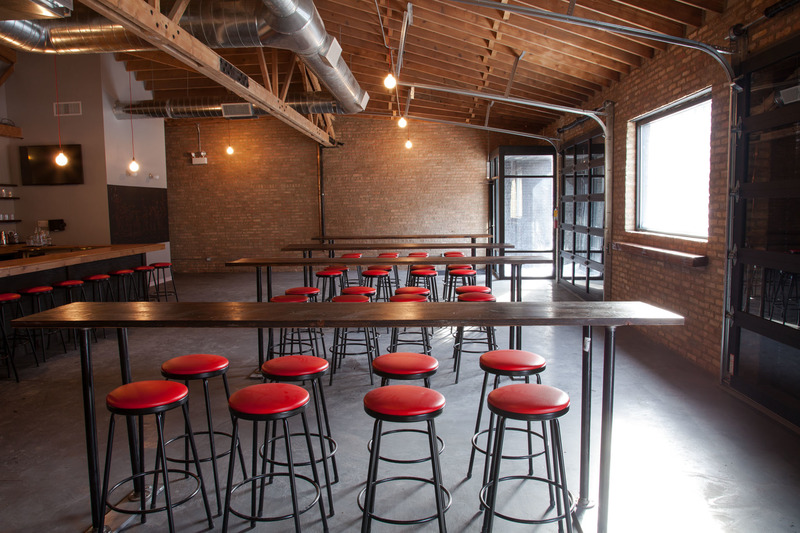 So why not spend an afternoon or evening at the watering holes that provide Chicago with our very own local liquors? 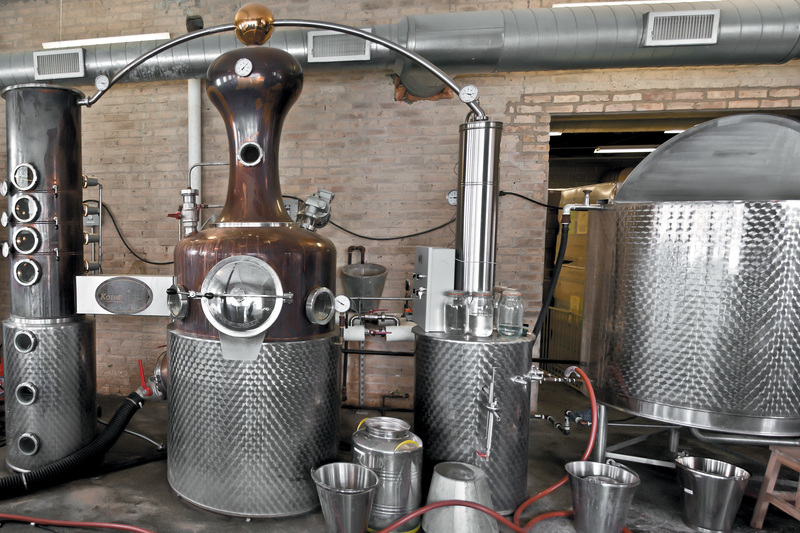 Here’s a look into some of Chicago’s best craft spirits and distilleries. 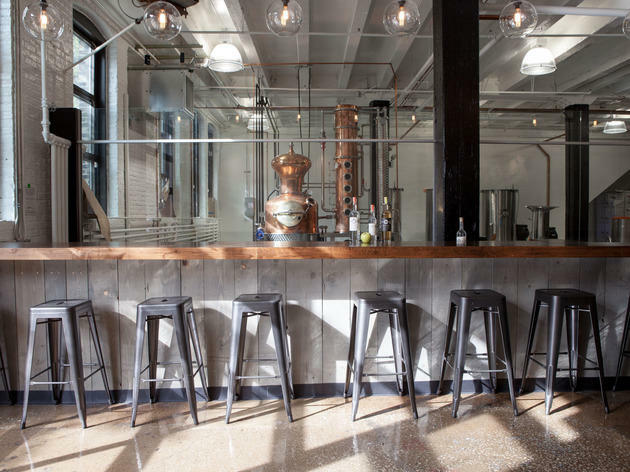 The oldest distillery in Chicago, KOVAL began in 2008 and snagged headlines as the first to open in Chicago since the end of Prohibition. Specializing in whiskey, KOVAL offers an unaged white whiskey in addition to their flagship trio of bourbon, rye and Four Grain whiskeys. KOVAL's dry gin comes aged in oaken whiskey barrels, which give the spirit an aroma of tea and honey alongside juniper. In addition to whiskey and gin, KOVAL offers a colorful selection of liqueurs—both fruity and floral. Try the rose-hip, a succulent red spirit with a jammy, aromatic flavor reminiscent of raspberry and raisin. Other liqueurs include ginger, orange blossom, chrysanthemum and honey, jasmine, coffee and caraway, the last of which tastes for all the world like a warm slice of rye bread with honey. Finally, try a sip of Susan for President, KOVAL’s recently-released peach brandy and an homage to founder Sonat Birnecker Hart’s Aunt Susan, who spent her life casually campaigning for the title of President of the World. Back in the day, Evanston was a completely dry town just north of the Chicago city limits. That day is no longer with us. 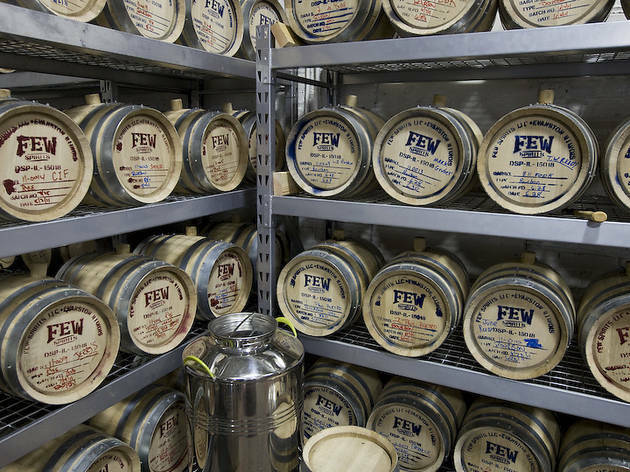 FEW Spirits, the product of years of legal wrangling by founder and former attorney Paul Hletko, operates out of an old garage in a narrow side-alley just north of Evanston’s Main Street. Don’t let the appearance fool you though; FEW’s products line shelves in over 23 states and 25 countries. 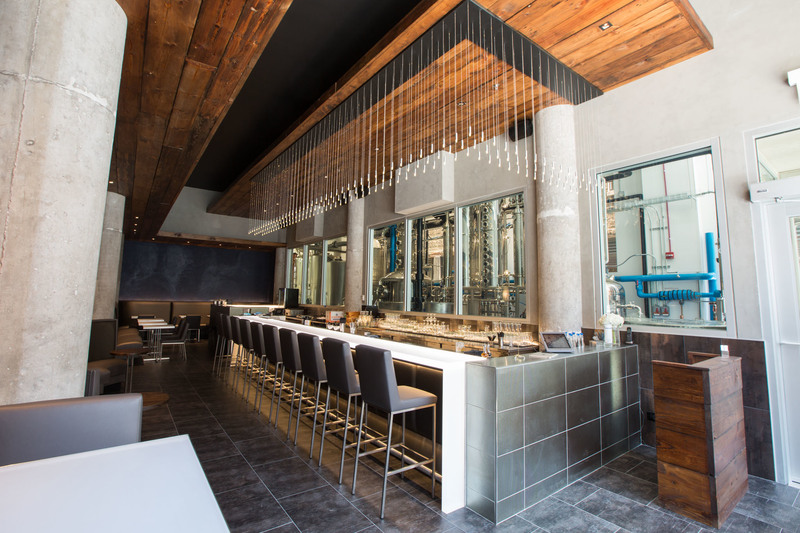 Their full selection includes an American gin, a single malt whiskey, a rye whiskey, a bourbon and a breakfast gin. If you’re looking for something a little different, you’ll want to give the breakfast gin a try. “No bacon and eggs were harmed in the making of this gin,” quips Katherine Loftus, FEW’s Event and Sales Manager. What will come through are notes of bergamot and Earl Grey tea alongside the standard fare of citrus and juniper. Be sure to also try the company’s recently-released Insurgint Gin, infused with blood orange and guajillo pepper in a tribute to local Chicago record label Bloodshot Records. Though it operates technically just outside the city’s limits, FEW is proud of its Chicago roots, and features iconography from the 1892 World’s Fair on all of its bottles. 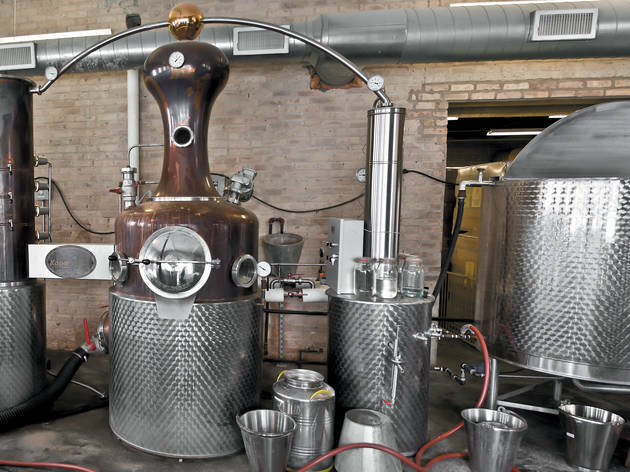 Founded by Charlie and Jenny Solberg in November 2013, this far West Loop destination is also Chicago’s first brandy-focused distillery. A family operation, Rhine Hall’s lineup includes brandy brewed in the Austrian tradition, brought to Chicago when Charlie quit his career abroad as a professional hockey player. Rhine Hall’s flagship apple brandy, distilled from 100% locally sourced Great Lakes–region apples, derives from the recipe the elder Solberg was taught when he wasn’t actually on the ice. Traditionally consumed after dinner to aid in digestion, the spirit’s gentle spice and apple aroma evokes nothing so much as a cozy autumn evening spent lounging beside the fire. Its sister spirit, the Grappa, is made from the grape skins and seeds left over from local wine-making—and comes on with a candy-sweet punch followed by the hearty burn of strong spirits. Both apple and grappa brandies also come in oak-aged varieties, having spent an additional three months aging in whiskey barrels taking on notes of wood and vanilla. For something a little off the beaten track, give the Rhine Hall mango brandy a try, wafty and reminiscent of palm fronds and gently swinging hammocks. Or, if straight brandy isn’t your cup of tea, you might just fall in love with the company’s special edition “La Normande,” a cheery combination of Rhine Hall apple brandy and fresh apple cider produced on-site from those same Michigan apples. After spending nine months in a former bourbon barrel, the spirit’s velvety sweetness might just knock you right off your stool. 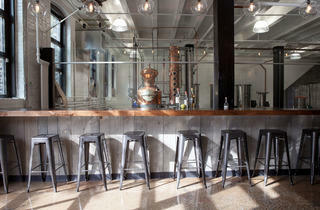 There is no tasting room in this industrious Ravenswood operation, and the distillery is not open to the public. Instead, Letherbee spirits are featured at numerous Chicago establishments such as the Violet Hour, Cherry Circle Room, and Logan Square’s Longman & Eagle; and the company's devotion to using all-natural ingredients has landed one of products on the shelves of Whole Foods grocery stores in Chicago and beyond. 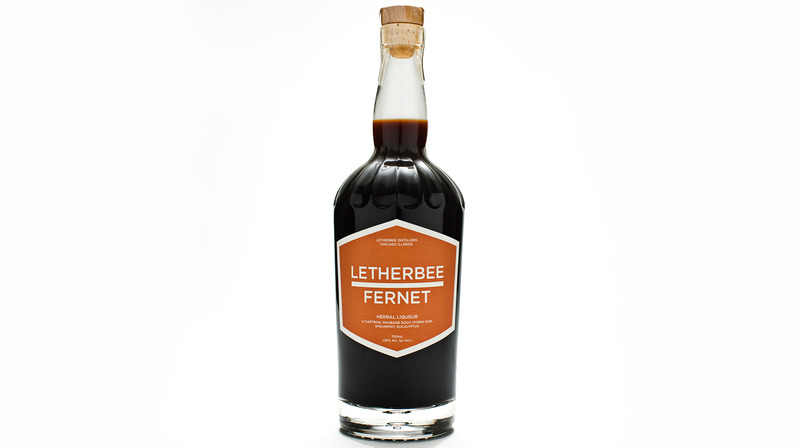 Meet the Letherbee Fernet, a dark and minty spirit that derives from a complex bouquet of 19 different botanical ingredients. You’ll taste mint, eucalyptus and a pinch of aloe ferox, making this spirit a uniquely soothing digestive aid. For those with a taste for a more common spirit, Letherbee’s signature gin shovels Balkan juniper berries by the bucketful into each batch, seasoning it with a menagerie of spices and herbs such as cinnamon, citrus zest and a hint of the cubeb pepper. Meanwhile, the Besk, inspired by the classic Chicago Malört, is probably the most drinkable of the famously bitter spirit to be found anywhere within Chicago’s city limits. Wormwood dominates the flavor, as is to be expected, but it also enjoys ample notes of the only fresh-cut ingredient used in a Letherbee beverage—fresh grapefruit. 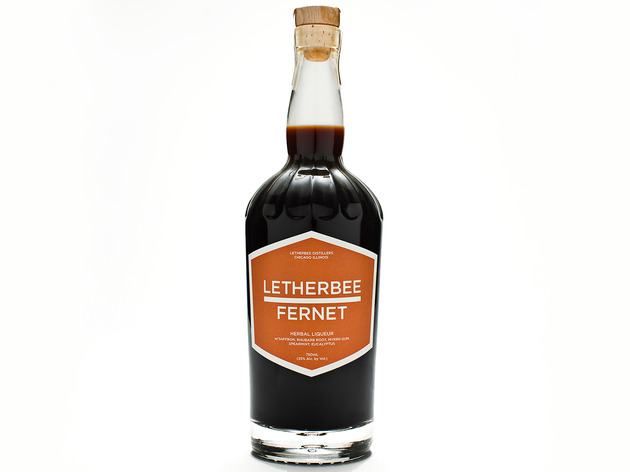 Last on Letherbee’s lineup is a barrel-aged absinthe, aged for six months in charred white oak whiskey barrels to imbue the well-known fennel and anise flavor with hints of vanilla, reminiscent of their inspiration—the classic Italian cookies baked by a former coworker of Letherbee founder Brenton Engel. 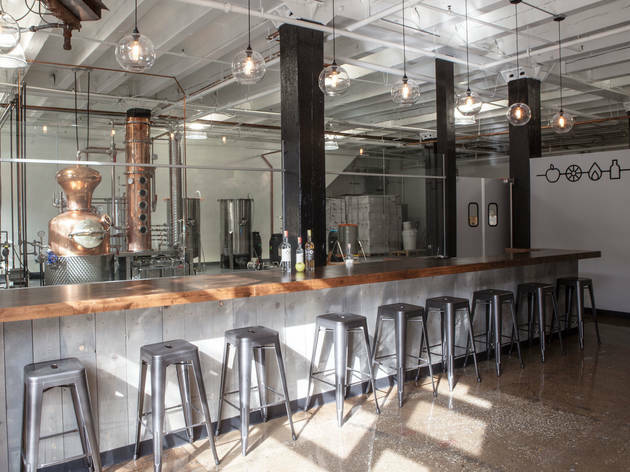 You might feel like an unexpected guest on an upscale cooking show when you first sit down at this distillery’s new digs in Green Oaks, IL. 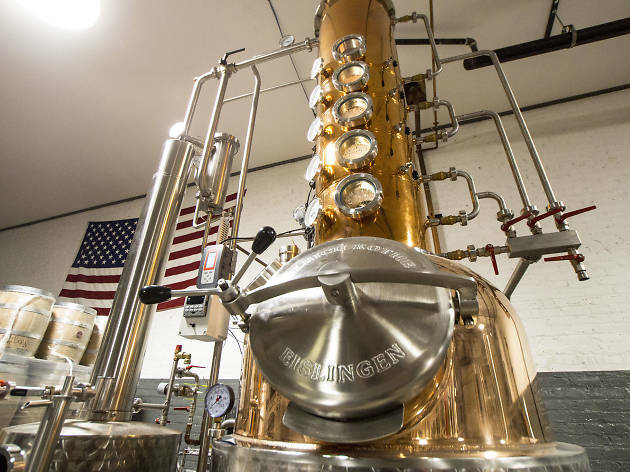 Earlier this year, the oldest craft distillery in the state moved from its original space into a former cabinet showroom several miles away. 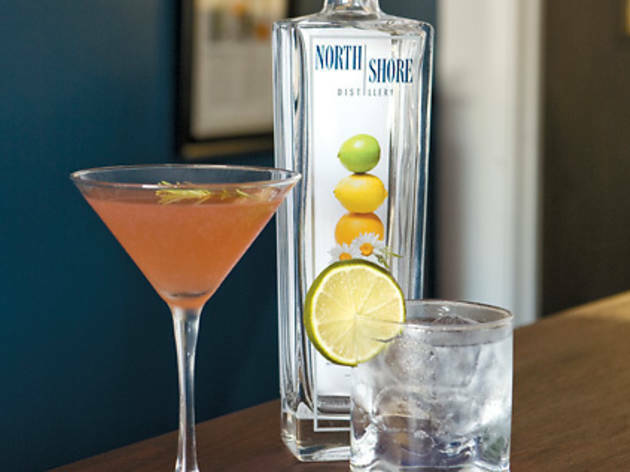 The showroom left most of its furniture when it went out of business, and North Shore Distillery co-owner, co-founder and Chief Cocktail Nerd Sonja Kassebaum was only too happy to put it to use. 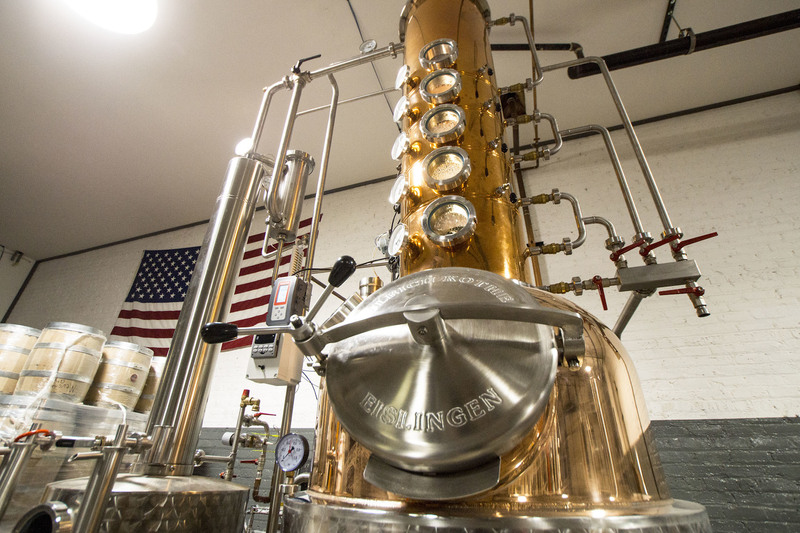 Specializing primarily in classic gins and vodkas, the distillery also offers a variety of less common spirits, such as their take on the classic Scandinavian aquavit, replete with notes of cardamom, cumin and cinnamon and the first of its kind to be produced in the United States. Another must-try is the North Shore Tahitian Vanilla Vodka, creamy and decadent enough to be sipped by itself or in any number of the tasting room’s cocktails. 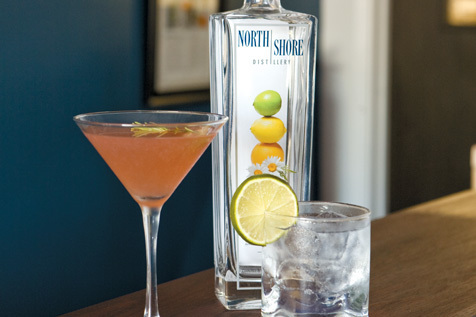 For a beverage bursting with the flavors of summer, try Karin’s Gimlet #2, made with North shore’s flagship Distiller’s Gin No. 6, fresh lime, ginger syrup and fresh-squeezed blueberry juice. Named for a regular who has since moved away, it’s called #2 because the first one wasn’t quite to Karin’s liking. For something more in tune with Chicago’s chilly season, give a try to the Spiced Apple Mule, a heartwarming blend of aquavit, house-made spiced apple syrup, fresh lime and ginger beer. 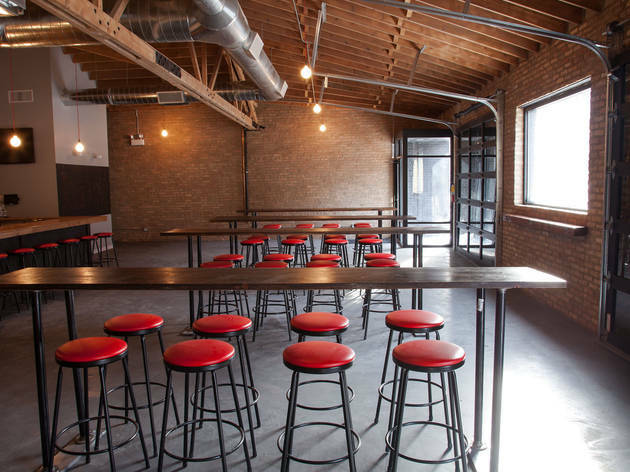 Whiskey is the name of the game at Logan Square’s Maplewood Brewery & Distillery. Founded back in 2014, Maplewood began by brewing beer but quickly decided to try turning some of their brews into harder liquors. 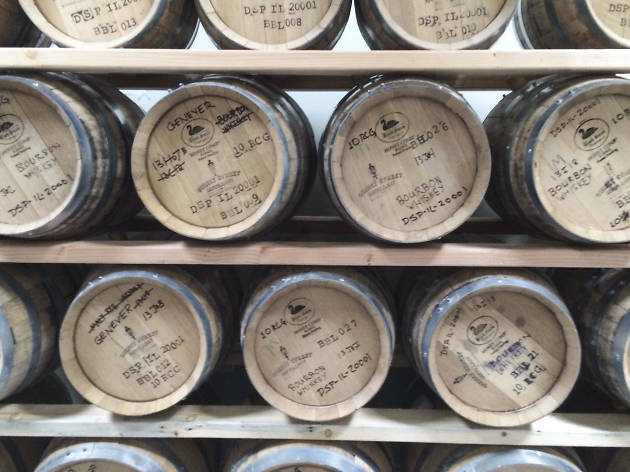 It’s been a long-awaited release—co-owners Adam Cieslak and Ari Megalis began filling whiskey barrels in September 2015—but the two plan to finally release their first three spirits to the public just in time for the holidays. 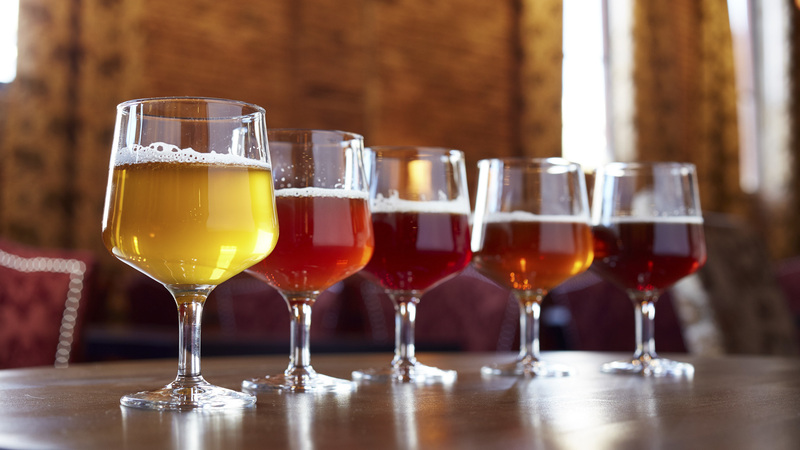 Each one is derived from one of the brewery’s beers, producing a range of unique and complex flavors designed specifically for beer enthusiasts. The first of these—a 100% malted rye produced in the Scotch-Irish tradition—offers a sweeter flavor with notes of honey and aged pear before finishing off with the classic spice most often associated with rye. Maplewood’s stout whiskey derives from the brewery’s well-known Fat Pug Oatmeal Milk Stout, and drinks like the perfect marriage between a dark beer and a whiskey, with tastes of chocolate malt, cocoa and hints of raisin. This quiet Riverside distillery and cocktail bar, modeled after an early 1920’s-era speakeasy, packs as much tradition into its spirits as it does flavor. 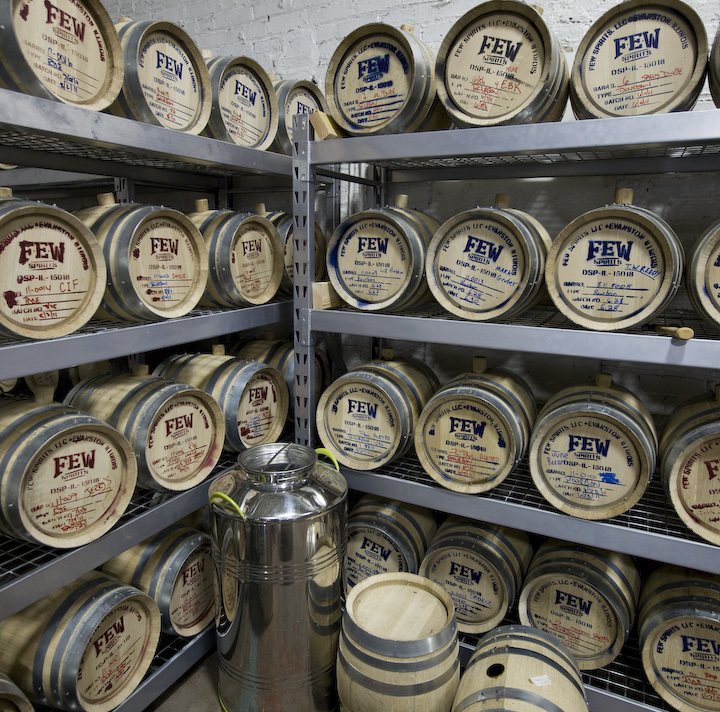 Owner Derrick Mancini, a founding president of the Illinois Craft Distiller’s Association and an aficionado of American liquor lore, is only too happy to walk customers through both the production process itself and the history behind the spirits his company produces. Try a sample of the signature Water Tower White Lightning unaged white whiskey, which can be enjoyed neat, on the rocks or—as Mancini suggests was most common in the 1900s—in a punch. 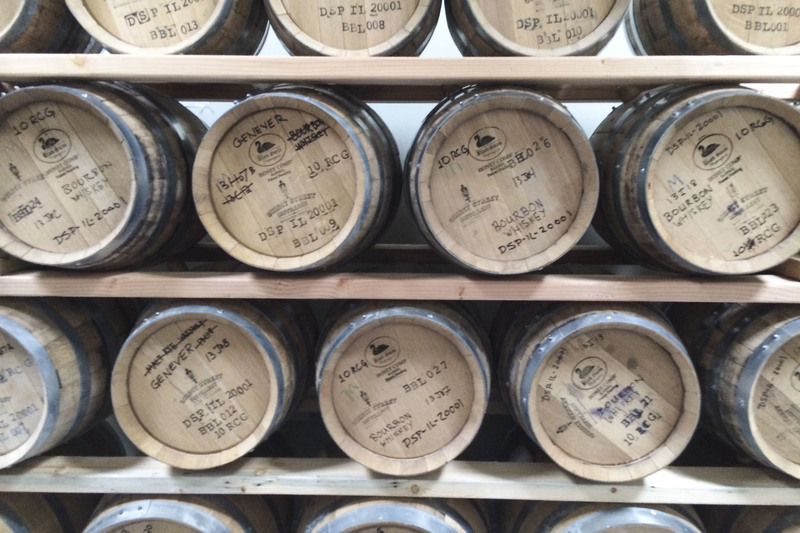 Follow that up with the Bourbon Spring, the product of aging the white whiskey for four months in a small charred oak barrel to produce an intensely flavored young bourbon that tastes of cherry and mahogany. Mancini is also a mead-maker at heart, and put his years of experience brewing mead in college to use transforming pure Illinois goldenrod honey into a delightful aromatic spirit he calls Prairie Sunshine. At the bar, try the Eva Shrub, which offsets Prairie Sunshine with a tart beet and carrot drinking vinegar, maple syrup, fresh-squeezed orange juice and ice, topped off with carbonated water. One of Mancini’s favorite drinks, the Brown Derby, combines either the Bourbon Spring or the six-month-old Laughton Bros. bourbon with fresh squeezed grapefruit juice and honey syrup for a sweetly refreshing take on a classic 1940’s cocktail. 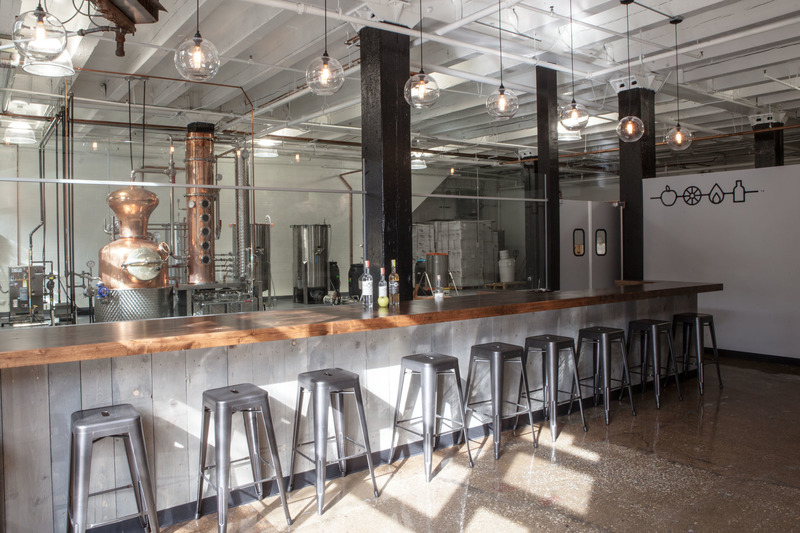 You’ll know you’re in the West Loop as soon as you walk in the door at Mark Lucas and Tremaine Atkinson’s CH Distillery west of Ogilvie Transportation Center. 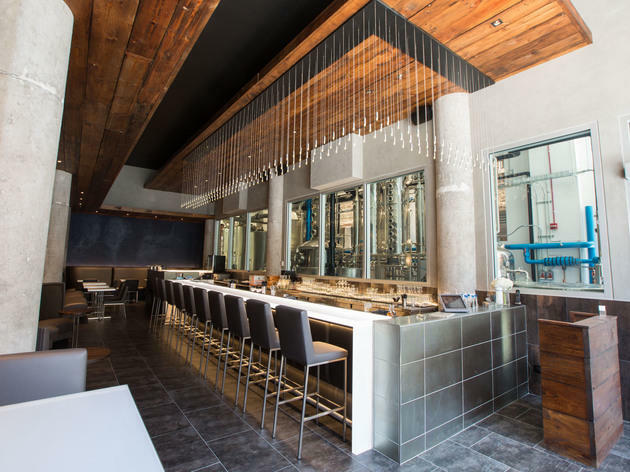 Part steampunk revival, part trendy new-age chic, the bar and dining area are dominated by the gleaming silver stills that loom from behind a seven-plate glass wall, and business hours seem to find the place perpetually bustling. With plans to expand production to a much larger facility, it’s clear that the spirits themselves are just as happening as the bar. The company’s flagship spirit is its CH Vodka, smooth enough to be sipped by even the most reticent of vodka drinkers. Drinkers of strong coffee will appreciate the far-from-subtle Amaro, resplendent in bitter notes of coffee, cocoa and molasses. For more adventurous palates, CH’s Peppercorn Vodka complements vodka’s standard ethanol burn with an entirely different kind of heat: the capsaicin sting of Tellicherry peppercorns. It’s great for cooking too; in fact, CH uses this peppery vodka to add a little extra warmth to its cacio e pepe pasta dish. Finally, try a taste of Giuliana’s Handmade Limoncello—handmade by Chicago resident and Naples native Giuliana Vitagliano —and you might just decide to skip dessert altogether and order another glass. 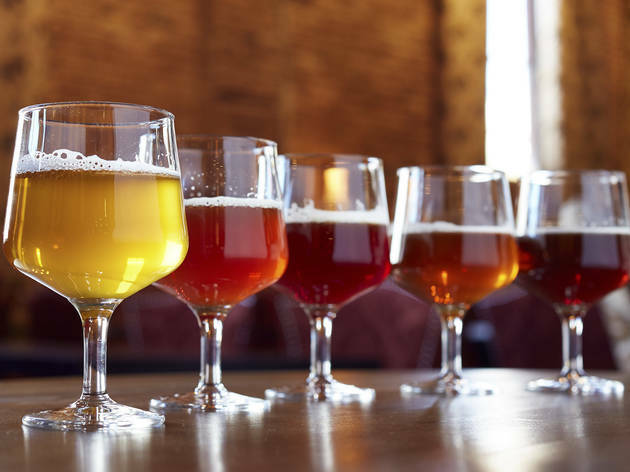 Whether you're looking for a new brewery to school you on some interesting brewing methods or want to try some of Chicago's iconic breweries in person, Chicago's breweries have a beer or three for you.